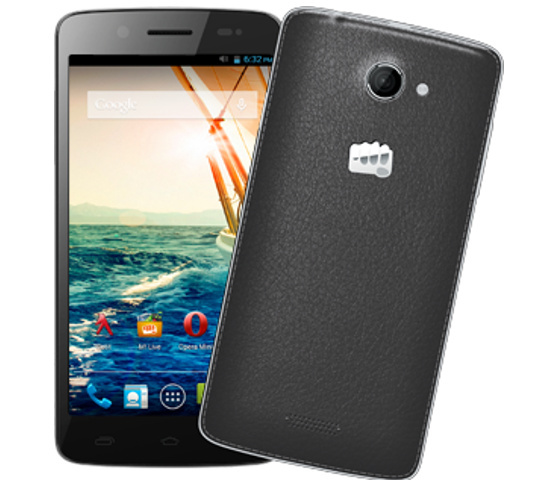 Micromax Canvas Elanza 2 A121 is now official, although the price is not known yet. Micromax A121 Canvas Elanza-2 has some nice specifications & features. It comes with a 5 inch display having 1280 x 720 pixels resolution. It gains the Strength from 1.2GHz quad core CPU. The Canvas Elanza2 A 121 runs on Android 4.3 Jelly bean operating system. It is successor to the Elanza A93. The Canvas Elanza2 A121 has Dual SIM support with dual standby. It is accomplished with 8-megapixel primary shooter and a 2-megapixel front camera. There is 1 gigs of RAM to make the handset fast. Talking about the storage the Micromax A121 has 4Gigs of internal storage out of which 2.23 GB is available for user. The Expandable memory is up to 32GB via micro SD card slot. The A121 Canvas Elanza 2 will be available in Black color.